Having lived in suburbia for the past year I have a few more things to add onto my original post. Plus a link-fest of relevant sites. I redid my house’s ‘walkability‘ and scored 46 compared to last year’s 55, even though I live in the exact same house (strange). In doing this I did not use even close to all my shower-water, or even a quarter of it. I shower for less time than the save-water timers, however I guess my shower-head is probably putting out easily 15-20L/minute. What I am trying to say is that I could have watered a lot more veggies than what I did. My resolve to do things that I believe in, like gardening, has recently extended to bike-riding. The station that previously I could walk to in 20 minutes is now a 5 minute bike-ride away. This also increases what I can take with me on a journey cos I have a fabulous bike-basket on the back. The other day I also connected lights which means I can ride home in the dark, this makes it a little safer for me to catch the train home late at night. I feel much safer speeding away from the station on my bike than walking away weighed down by stuff. I’ve also found that church is within riding distance, as are some family member’s houses and many many shops. This is not only making me healthier but cutting down on my car use which not only saves money, but the earth. Talking about saving the earth, I went to the Sustainable Living Festival (highly recommended), and Cecilia told me that to have a worm-farm is to save the world. After a little bit of thought I totally agree (although obviously not as the only thing one does). Worm farms can be made by anyone, anywhere – even if all one has is a balcony – and thus those in the suburbs have no excuse. However wormfarm costs seem to be generally in excess of $100 (after a quick google), the solution to this is to make your own. Most DIY worm-farms recommend using polystyrene, but I just can’t condone that, so I found one that also recycles old stuff. Now cynics (like young Joanne) claim that worm farms are so hard to maintain that even my Mum (aka gardensuperwoman) killed worms in her younger days, but she had younger kids in those days and rather than persevere she gave up. Cecilia says that everyone kills their worms every now and then, apparently they all die once they hit 30*C. Some tips for preventing that are to keep them in the shade on those killer hot days, and also to put a wet towel over the contraption. So, given the fragile vitality of a worm, my solution to not having to go out and buy worms everytime the weather hits 35*C in Melbourne (lots – here is a few tips on how to survive those days), is that people can share (a novel concept I know)! Worms take about 6 weeks to get to full capacity, so after that one can give half ones worms to someone who has lost theirs for whatever reason. Related to worm-farms is composting. I recently made my mother’s sister a compost bin (a cardboard box weighed down with bricks after the first one blew away – whoops). I also wrote her up a list of what can and can’t go into the compost (for a good website – check this out). However I would say the basic rule is any raw chopped up veggies (bar onions – which apparently kill worms, or so I’ve heard… can anyone confirm or deny this?). 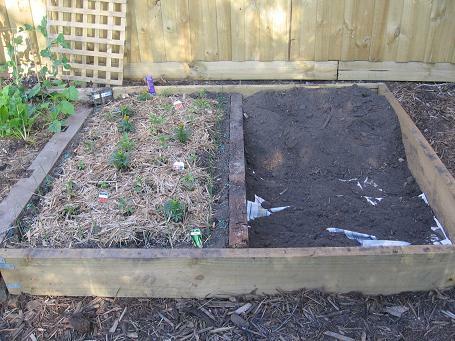 Joanne and I disagree on a lot of compost points – I chop things up so they break down easier, Joanne doesn’t bother; I put seeds in (so they GROW without me doing anything), Joanne does not (she says they make stuff grow in the compost). However look out! Some people are not very forward-thinking, and don’t think composting is necessary. Scary. Talking about growing seeds, Corrente has a pretty intense series on growing seeds, this book by Nancy Bubel seems to come highly recommended from a number of sources. Still on the topic of seeds, leftover sunflower heads can be used as a cheap bird feeder. Moving up from seeds, there is the food side of things. I have read a couple of things about urban foraging, and if anyone knows anything about what can be urbanly foraged in Melbourne I would be very interested. The Vic Market website has a great list of seasonal veggies (with pictures! ), that I intend to make good use of, especially when I move out of home, and when you buy too many fresh veggies, you can read all about how to freeze them here. In my own life I made Nectarine Jam using about 10 Nectarines (and one peach) that were starting to go mouldy, I cut those parts off, and it turned out really well :). Now, if one is to freeze all this excess produce that we have grown and bought, we are going to need electricity to power the freezer. At 15metres tall, these are probably not appropriate (or within the budget) for most people, however I know people (okay, my boyfriend) who can make a homemade windmill that works and everything. My father has suggested that the fact that batteries and the like still need to be used is problematic as that is not truly sustainable, but still, while we are doing the ‘use energy’ thing, wind power is so much better than coal (especially dirty coal). Homegrown Evolution featured a bike-powered washing machine. Which takes away the need for a battery to store charges or a grid to feed into. And of course, the wine cellar to end all wine cellars, one that doesn’t take up too much room as well. I would love one of those now, and I would have loved a cubby-hole like that as a kid! Something a little easier to create yourself is this handy little stool, this will help reach those high up jam-jars and other preserves that I have not yet worked out how to make. This flowchart/brainstorm lists a bunch of good ideas that are worth researching and implementing. And to finish up, if anyone is interested in reading more on the suburbs, this series by The Oil Drum is worth looking at. Gah! I totally forgot to add the link that inspired me to write this post. Amazing to see good stuff come out of a tragic situation, it makes me want to move to the US and buy a $100 house. I took a few pics this afternoon and then I went and watered the garden with some greywater. Opa was digging up a garden bed that is next to the driveway because the driveway people are coming early tomorrow morning, around 7.45am. So after he took the plants out I started to dig some of the dirt up, I didn’t get very far along when I stopped, cos I thought I was just getting all weeds, plus the watering system was all in my way. Later on I came out and Opa had removed the watering system and dug up a whole lot of dirt. We dumped it into the bed and mixed it over with the other dirt. There was too much in there, so we raked through it picking out the roots that had come through from the other garden. Then we shovelled some of the extra dirt out and sifted through the rest. 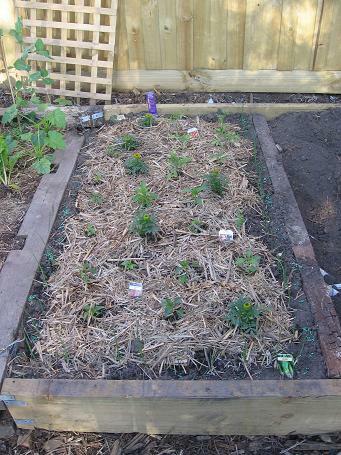 I put some blood and bone in as well as some other stuff that Joanne told me to put in, I think it helps keep the soil moist. After that I watered it all in using some leftover water from the watering can, I was going to leave it to see if it would rain, and Opa thought I should use illegal water, but I found the watering can and used that. If you wanna see pics you have to go to facebook. Today was such a loverly sunshiney day that I wanted to be outside. 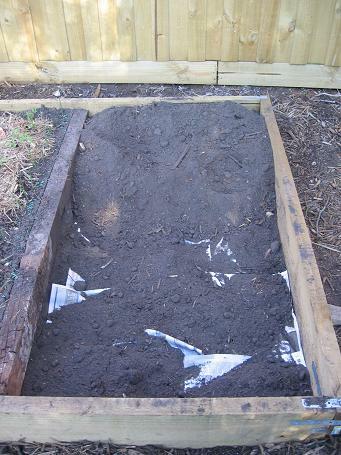 So I decided to move the dirt around in the second bed and put newspaper under it. For some reason I expected that to be very easy, not to say it was hard, but I got all hot and sweaty in the sun. But I persevered and there is now newspaper under it all. I also came across at least three worms, so that is good news. (I don’t think I killed any either!). In the process of moving the dirt, it was hard to know where the dirt finished and the ground, which previously had a layer of chunky mulch-type stuff which was mostly sticks. So I ended up with a bit of that mixed in with my dirt. I don’t want to water my garden using tap water, even in the 4 hours that I am allowed to. Which is, Tuesday and Sunday between 6am and 8am. Or, because someone over 70 lives here, it can be the same days, but 8am and 10am instead of 6 to 8 (w00t). But I think that when so many peoples don’t have good drinking water, to put it on my garden is silly. That being said I use perfectly good drinking water to flush my toilet, so I’m far from good. Anyway, they say not to use grey-water repeatedly for the same garden, and Joanne reckons you shouldn’t use grey-water on the veggies. But I reckon that cos I don’t use soap in the shower, the run-off water is all perfectly fine, it will just have a few Jocelyn-germs on it. I think Joanne agreed with me on that point. Once actual edible parts start growing I may act differently, we shall see. You can see some of the newspaper under the soil that has been moved around. As you can see, it hasn’t grown too much in the last two days. And a shot of both sides. If I was my father, I would work out an exact camera angle and take a photo from there everyday, so that I can make a time-lapse vid after stuff grows… I will work on that.